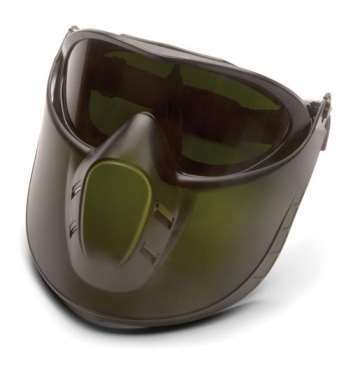 capstone goggle incorporated with removable shield provides full face protection. The shield with ratchet allows user to open or close in 3 positions for adjustment; 4 ventilation holes provide appropriate airflow. The polycaronate shield conforms to the face offering increased impact and dust protection. Indirect-vent frame provides protection against splash and dust. Soft vinyl goggle body conforms to facial contours for a very comfortable fit. Includes 2 disposable tear off visors, which can be replaced as they become dirty or scratched. Commonly used around welding sites or for medium to heavy cutting and medium to heavy gas welding. Only the goggle contains IR dye. Due to the nature of the vented holes, the shield is only green tinted and does not contain the IR resin.